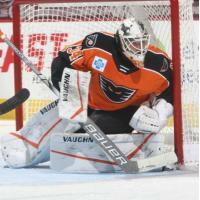 Lehigh Valley, Pa. - Alex Lyon earned the number one star as the Lehigh Valley Phantoms (22-15-2-2) stole two points in a 3-2 shootout win over the Rochester Americans (24-13-2-1). Lehigh Valley's goaltender faced 51 shots and made a (regular season) career-high 49 saves, a mark that is the second-most in Lehigh Valley Phantoms history and the most ever at PPL Center. Lyon made at least 15 saves in every period, including 17 in the first and third, plus two more game-saving saves in overtime. Mike Huntebrinker scored the shootout winner to give the Phantoms two points in the first AHL shootout attempt of his career. There was some extra emotion to this game, as Taylor Leier and Justin Bailey each faced their former teams for the first time, just two days after being traded for each other. Taylor Leier was honored with a video tribute and the sold out crowd of Lehigh Valley fans showed their appreciation for his 226 games (ranks second in Lehigh Valley history) with the Phantoms. On the hockey side of things, Alex Lyon continued his stellar play in net, making 17 saves in the first period, including killing off three Rochester power plays, to keep the game scoreless through the first period. With Lyon working to keep Rochester off the board, Connor Bunnaman got Lehigh Valley on it 5:39 into the first period. The rookie forward got behind the defense off an outlet pass from Reece Willcox and snapped a wrist shot that was able to sneak through Adam Wilcox for his 12th goal of the season. Bunnaman now has scored in a career-high four straight games and also extended his point streak to a career-best six games. Rochester was finally able to get one by Lyon on their 28th shot of the night. A turnover gave the Amerks a 2-on-1 chance and though Alex was able to make the first save on Wayne Simpson's blast, Kevin Porter was there to put back the rebound and tie the game 1-1. The Phantoms retook the lead six and a half minutes later when Greg Carey blasted a one-timer that hit nothing but the back of the net. Mike Vecchione slid a pass over to a locked-and-loaded Carey, who went down to one knee and hammered his team-leading 19th goal of the season. The AHL All-Star currently ranks 5th for the most goals in the AHL this season. Rochester was able to once again tie the game with 6:09 remaining in the third period. With Lyon being screened in front of the crease, Matt Tennyson was able to snap a shot through traffic and in to make it 2-2. 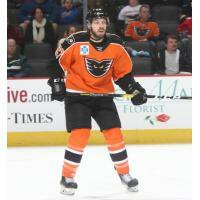 With nothing doing in overtime, the Phantoms sent out Mike Huntebrinker to take the first attempt in the shootout. Huntebrinker skated down and went forehand, backhand, forehand and tucked it into the far post for his first AHL shootout goal. Alex Lyon shut down the three Rochester shooters and the Phantoms secured the second point. The Phantoms entered the game with the best penalty kill in the AHL at 86.6%. The PK unit was put to the test tonight and continued to excel going 7/7 tonight, tying a season-best performance, and increasing their success rate to a league-high 87.2%. NEXT TIME OUT: The Phantoms play a Monday Matinee against the Wilkes-Barre/Scranton Penguins at 1:05 in Wilkes-Barre. Lehigh Valley will return to PPL Center on Wednesday January 23, to face their other in-state rival, the Hershey Bears at 7:05.